Ray Faulkner of thermal imaging company iRed with one of its drones. 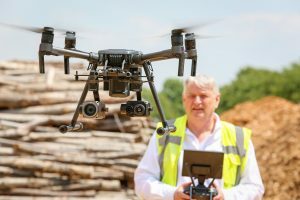 An industry-leading thermal imaging company in Hampshire is supplying emergency services across the country with drones fitted with specialist cameras. iRed launched its ‘search and rescue’ packages after a decade of research into aerial thermography and the company has supplied six police forces to date. The company, based in Emsworth, also provides the training in using the drones and interpreting the data supplied by the cameras. Fire and rescue services and the coastguard have also shown an interest and have attended demonstrations of the technology. The kit enables immediate searches to be made and for large areas to be swept from above for heat signatures. With cameras getting smaller and the advances in drone technology, iRed was able to create the advanced system. When a person goes missing, speed is of the essence and at night one of the best ways to find someone is by utilising thermal imaging technology. The ‘thermo-drones’ are able to scan large areas and detect heat and shape, enabling search parties to be directed to the correct location. As well as a thermal imaging camera the package includes a highly sophisticated optical camera with enough zoom to read a numberplate from a mile away, which means the system is just as useful in daylight. A two-day training course is also included and focuses on the equipment, set-up and how to use it for search and rescue. Ray Faulkner, Managing Director of iRed, is one of the pioneers of thermography. He said, “This use of thermography is literally a life saver. Traditional uses for this technology are based around the property industry, but we are diversifying rapidly. We have been at the forefront of connecting thermal cameras and drones and our ‘search and rescue’ package has been incredibly popular. “Each customer receives a bespoke package depending on their requirements; for example a client might prefer a lighter drones if it will be used in urban areas. With the proper training, a drone pilot can quickly search a wide area for a missing person or, indeed, animal. As long as the data are correctly interpreted then these searches can be over in minutes. “It is a cost-effective solution for the emergency services and the feedback we have had has been excellent. Previously, police forces have had to scramble helicopters, but now the cost and time have been drastically reduced.